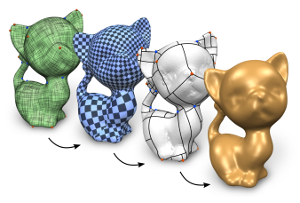 A variety of techniques were proposed to model smooth surfaces based on tensor product splines (e.g. subdivision surfaces, free-form splines, T-splines). Conversion of an input surface into such a representation is commonly achieved by constructing a global seamless parametrization, possibly aligned to a guiding cross-field (e.g. of principal curvature directions), and using this parametrization as domain to construct the spline-based surface. One major fundamental difficulty in designing robust algorithms for this task is the fact that for common types, e.g. subdivision surfaces (requiring a conforming domain mesh) or T-spline surfaces (requiring a globally consistent knot interval assignment) reliably obtaining a suitable parametrization that has the same topological structure as the guiding field poses a major challenge. Even worse, not all fields do admit suitable parametrizations, and no concise conditions are known as to which fields do. We present a class of surface constructions (T-splines with halfedge knots) and a class of parametrizations (seamless similarity maps) that are, in a sense, a perfect match for the task: for any given guiding field structure, a compatible parametrization of this kind exists and a smooth piecewise rational surface with exactly the same structure as the input field can be constructed from it. As a byproduct, this enables full control over extraordinary points. The construction is backward compatible with classical NURBS. We present efficient algorithms for building discrete conformal similarity maps and associated T-meshes and T-spline surfaces.